God is good. Create beautiful art. Hello everyone, I’m Becky and this is my pattern! 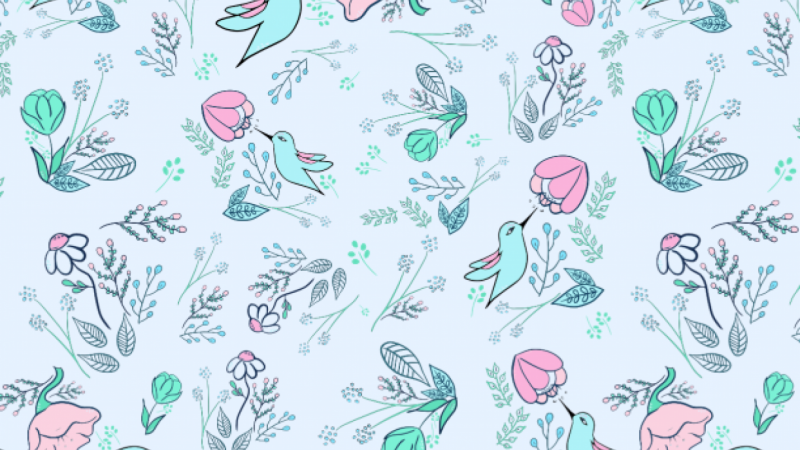 This is my first time creating a pattern and my first skillshare project. Woohoo! I had fun and learned so much during this class. I used the programs Inkscape, GIMP, and Clip Studio Paint throughout this project. It was challenging but interesting to create this pattern, and I am excited to keep exploring pattern design. Thank you for your wonderful class Bonnie! I mostly used pinterest to look around for ideas and inspiration. Here are some of my sketches. I doodled a bunch of sketches and picked out some that I liked for the pattern. I put a box around the sketches that ended up in the pattern. Here are a few after digitally inking them. This is my original color palette. I used the coolors.co website to pick a palette I liked. I’m a fan of blue and pink so I chose to use a palette along those lines. I also tried other colors and adjusted the colors for different colorways when the pattern was complete. Here are the motifs I came up with for my first pattern. I also tried the half-drop pattern and I made a different motif for that one. This is the half-drop pattern. It’s called Spring Day Dream. I’m showing it in a different colorway called Midnight. Okay so I went a little crazy and tried a few more patterns around this theme. I wanted to try a few simple patterns as well, so here they are. They all make kind of a mini Spring Day collection. Here is Spring Day Simplicity. For Simplicity I changed the detailing of the art and simplified the colored elements by removing lines and detail, which made a sort of shadow-like effect that I thought was interesting. Here is an example of the sketch transformation (the first step). And this is Spring Day Calm in colorway Night. In Calm, one of the sketches was further simplified to just an outline. Like the second step in the sketch transformation shown above.